This dialog is obsolete since CaWE release 8.02 (February 2008). If you employ CaWE version 8.02 or newer, please refer to the new Entity Inspector dialog instead. 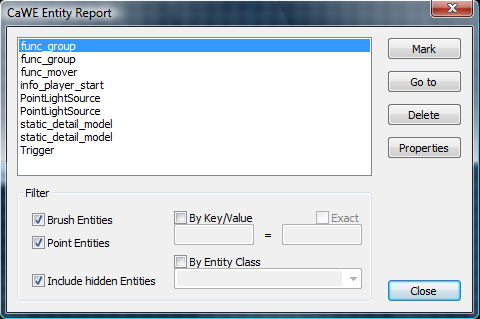 The new Entity Inspector dialog subsumes all functionality of this Entity Report. This dialog is accessed by clicking on the related item in the The Map Menu. It shows a list of all entities in this map, that is filterable with different filter options. Entity list: A list of all entities in this map, filtered by the given filter options below. Mark: Marks the currently selected entity in the list on the map. Go to: Centers the views onto the selected entity from the list. Delete: Deletes the selected entity from the list and the map. Properties: Opens the Properties Dialog for this entity. Brush Entities: Show brush entities in list. Point Entities: Show point entities in list. Include hidden Entities: Show hidden entities in list. By Key/Value: Filter the list by a specific key/value pattern in the entity properties. Exact: Toggles if the key/value pattern has to be exact the same or if a partial match counts. By Entity Class: Filters the list by entities from a specific entity class.